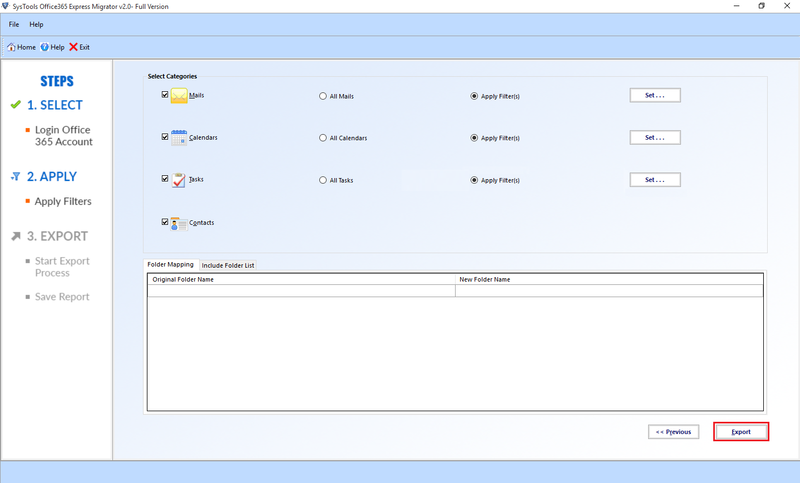 Transfer Office 365 tenant is a process where you transfer data from one Office 365 tenant to a new tenant. In this process, you will have to move Office 365 tenant users data which include emails, contacts, calendars, tasks. Apart from email migration, sometimes you have to transfer other data. Because organizations adopt many Office 365 services like OneDrive, SharePoint, in such situations this transfer Office 365 tenant task become more complex for you. But that doesn’t mean Office 365 tenant email migration is an easy task, this task is also complex itself. But this transfer Office 365 tenant to tenant task become more complex if you have multiple Office 365 services. Although Microsoft announced to provides facilities to make this Office 365 tenant to tenant transfer task easy for the user, right now there is no facility available for this. 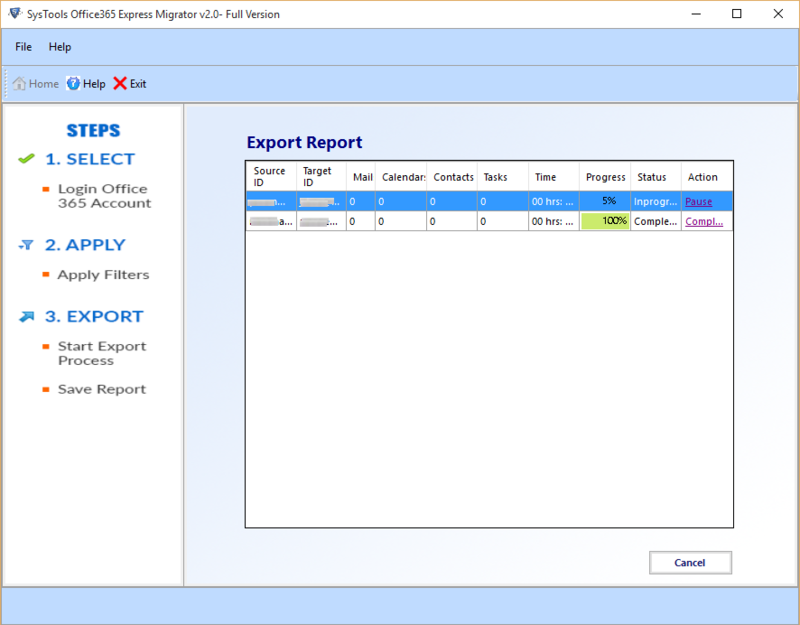 Therefore, to accomplished this task you have to use an automated migration tool. So in this upcoming section we will provide you a solution for how can you move office 365 tenant to another tenant. 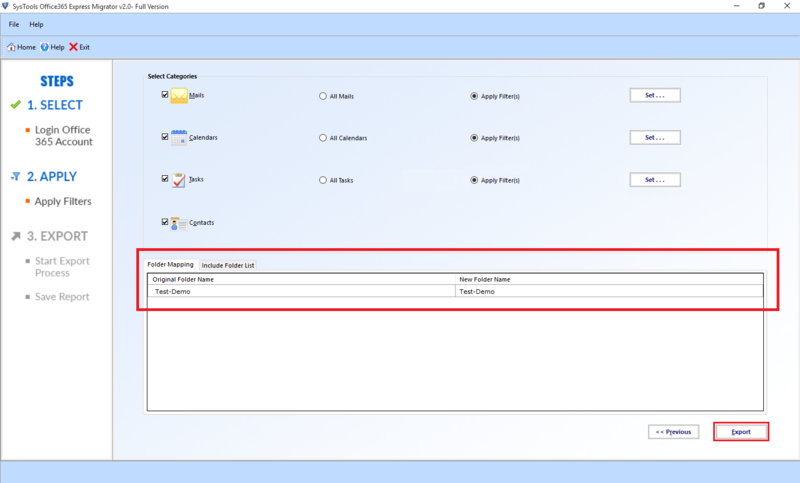 Office 365 user mailbox contain data like emails, contacts, calendars, tasks, so when you decided to transfer Office 365 tenant, you have to migrate these items from one tenant to another tenant. In this Office 365 mail migration process, you have to migrate entire users mailboxes, admin mailbox, as well as shared mailboxes. One more issue that you have to know that is email migration of custom domain or mail domain which is associated with your Office 365 tenant. Microsoft provides facility to add the custom domain in Office 365 tenant, so if you have a custom domain in Office 365 tenant, then you have to migrate mailbox data of domain. We have discussed what you have to migrate, but the question is how to transfer Office 365 mailboxes to the tenant? 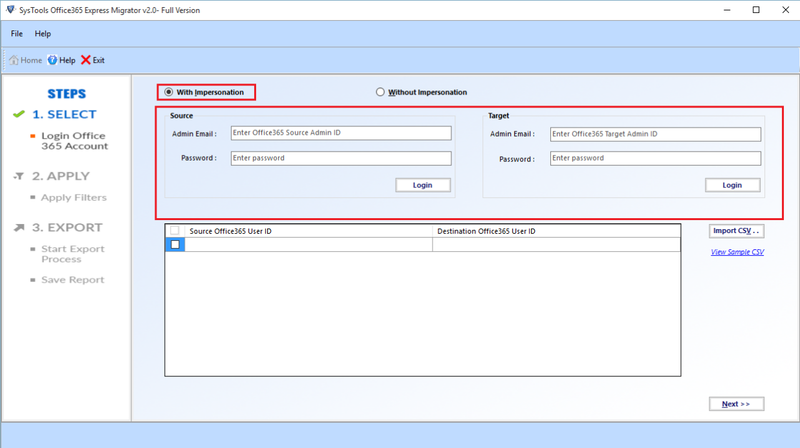 – so to perform this task you need Office 365 tenant to tenant migration tool. This tool very effectively works and allows to move users mailboxes, Admin Mailbox, shared mailboxes, custom domain mailboxes. It will migrate emails, contacts, calendars, tasks from multiple Office 365 account at a time. It will transfer the entire mailboxes from one tenant to another Office 365 tenant easily. Now, we are going to explain the working procedure of the tool to transfer Office 365 tenants data. Let’s start the procedure. Before starting the procedure you have to download the tool, because we all know without the tool we cannot move Office 365 tenant to another tenant. Start the software & select with impersonation option. 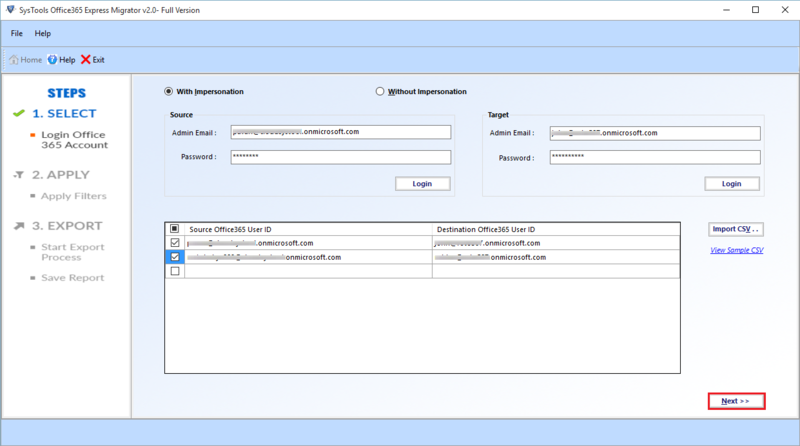 With Impersonation option, you can migrate users mailboxes, shared mailboxes, & admin mailbox. 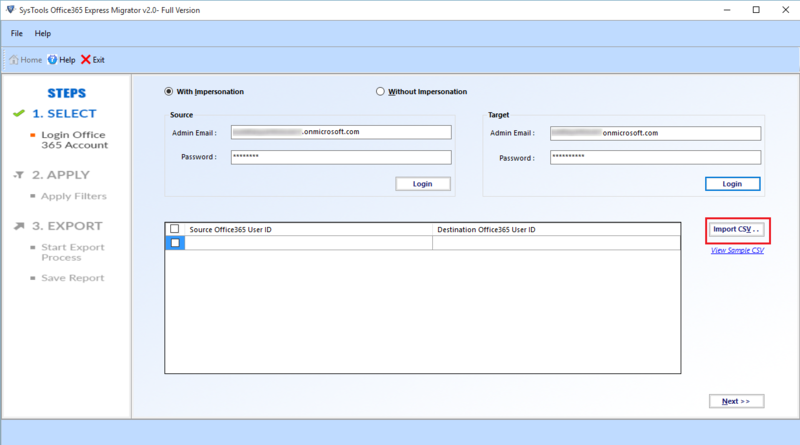 Now, the entire source & destination admin user credentials. 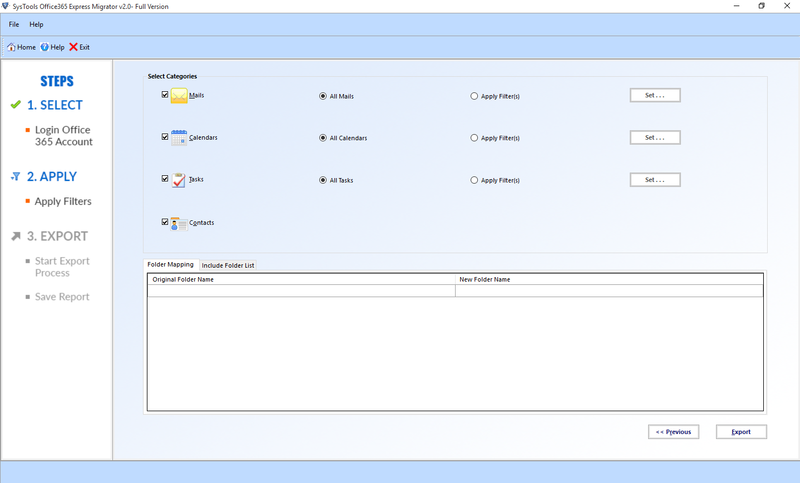 Software provides Import CSV option, with this option you can import all user ID’s which you want to transfer into another tenant. If you want to transfer Office 365 tenant shared mailboxes, then you have to enter source shared mailbox ID and destination ID where you want to move shared mailboxes data. After add CSV file, click on Next. Now, select the items which you want to transfer, the tool also provides a Date Filter option to move only selected data from the tenant. To move folders software provides Folder Mapping & Folder Include option. Now, click on the Export button. Now software successfully completed Office 365 tenant to the tenant transfer process. Now, you have successfully transfer Office 365 tenant. To access data you have to login into Office 365. 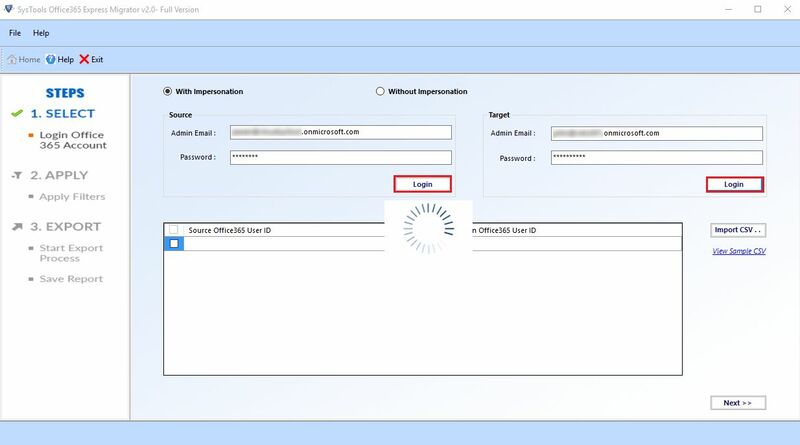 Transfer Office 365 tenant task is complicated & complex task, there is no manual solution available, so you have to use an automated migration tool. In this blog we explained how can you move Office 365 tenant to another tenant with users mailboxes, admin mailboxes, shared mailboxes, & domain mailboxes.